Do you know what diamonds, rubies, and emeralds are? “Jewels” is the answer most people offer. It’s an accurate answer, but it doesn’t tell the fascinating story behind these treasures from nature. Jewels are the end result of a process begun billions of years ago when the Earth was first formed. All that existed originally were the elements. Common elements you may be familiar with include oxygen, silicon, and carbon. Gold and silver are also elements. Far below the Earth’s surface, where they were subjected to tremendous heat and pressure, certain elements combined to form minerals. Atoms of an element may combine with other atoms of the same element; or they may combine with atoms from other elements to make compounds. Sulfur is a pure mineral, that is, it contains only sulfur atoms. Sulfur atoms may also combine with iron atoms to form a compound mineral called pyrite. Minerals, and substances made from them, all belong to the mineral kingdom, which includes more than 3000 members. Approximately 100 minerals are classified as gemstones. Although a few gemstones are used for industrial purposes, most have value solely to collectors. Only about a dozen gemstones are suitable for use in jewelry. Due to the exquisite way in which most gemstones crystallize, they were described as “the flowers of the kingdom” by Abbe Hauy, an early French crystallographer. Diamond, which is pure carbon, is the only gemstone formed from one element. All the other minerals that we classify as gemstones are compounds–they are minerals that include atoms from more than one element. Minerals formed from more than one element are also called chemicals. Like other minerals, gemstones can be described by chemical formulas. For example, quartz is a combination of silicon and oxygen called silicon dioxide. A gemstone’s chemical composition determines its appearance. Although they are both blue stones, sapphire and turquoise look and feel entirely different. That’s because sapphire is an aluminum oxide (aluminum and oxygen) with a trace of titanium, while turquoise consists of aluminum, phosphate, and copper. Another important factor affecting the appearance of gemstones is the way in which the atoms are bonded together within the stone. Diamond and graphite both are pure carbon and have identical chemical formulas. However, they are entirely different substances due to the way the carbon atoms in each fit together. Carbon atoms in a diamond crystallize in a tightly-bonded regular pattern. The same atoms in graphite form scales or irregular masses, which makes it soft and slippery. Three criteria distinguish the flowers of the kingdom from other minerals: their beauty, rarity, and durability. Beauty in gemstones, like everything else, is a matter of personal taste and changing fashions. The beauty in some gems, like turquoise, is based on color alone. In others, the color is secondary to the brilliance, or “fire,” such as with diamonds, the most prized of which are colorless. A variety of colors in one stone, such as the green stripes in malachite, appeal to many. Gemstones that are hard to find are valued more highly than those that are abundant. Treasured for its changeable colors, alexandrite is also valuable because it is so rare. Very little natural alexandrite exists. 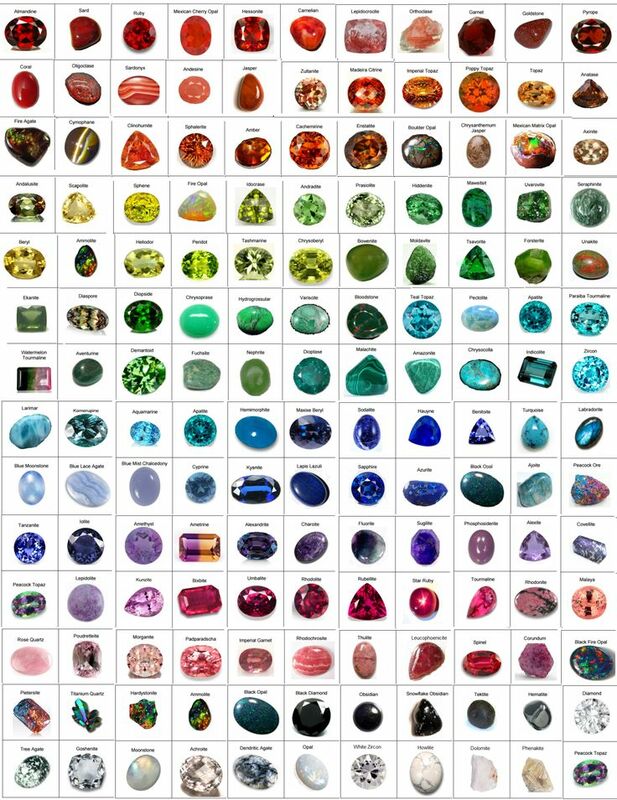 Other gemstones, although seemingly abundant, yield only a few specimens that are of usable quality. Gem-quality opals are difficult to find and very expensive. Common opal is abundant and inexpensive. Many rare and beautiful gemstones can’t be used in jewelry because they aren’t durable. They disintegrate or break too easily. To be durable, a stone must be stable, tough, and hard. Stable gemstones remain unchanged by heat, light, or chemicals. For example, strong light can cause yellow topaz to fade. Toughness refers to the brittleness of a gemstone. The more brittle it is, the easier it will break. Jadeite and nephrite (the two jades) are the toughest, or most difficult, to break. Hardness, which is different from toughness, is the ability of a gemstone to resist scratching and general wear. Diamonds are the hardest of all gemstones. Gemstones usually go to a lapidary after they are mined. The lapidary does the final cleaning, which may involve grinding off the matrix, or rock, in which the gemstone was buried. While some gemstones may be simply polished, most are cut. The softer ones, like turquoise, are usually cut in rounded shapes called cabochons. Cabochons were the only way in which stones were cut until about the 14th century, when faceting was developed. Only the harder gemstones can be successfully faceted. Faceting is the process of cutting a gemstone to improve its beauty by making it reflect more light. A faceted stone has had all rounded and uneven surfaces cut into flat “faces,” which are highly reflective. A gemstone that has been cut and polished is called a gem, or jewel. People who study gemstones and gems are called gemologists. Gemology is a relatively new field that began as a speciality of mineralogy. Gemologists must understand mineralogy, crystallography, physics, chemistry, and geology. As more synthetic, enhanced, and imitation gems become available, gemologists must also acquire the knowledge and equipment necessary to distinguish fake from real. The flowers of the kingdom have captivated people since prehistoric humans first picked up shiny stones from ancient streambeds. These dazzling treasures from nature, eons in the making, are today crafted into jewelry of timeless beauty. Come in to luxamart today for the greatest value for your jewelry needs! We buy, sell and repair and clean diamond rings, gemstones, gold, silver, platinum and coins to help with investment. We also sell and buy and repair luxury watches, Engagement rings, necklaces and much more. We are located in booming frisco, TX at Lebanon and Preston Rd. How do I know if pearls are real?If you are a coin collector or seller come to Luxamart today!